Following a bus attack by terrorists in Paris earlier this year, Detroit Police Chief James Craig suggested that the reason there haven’t been any terrorist attacks in Detroit is that so many locals carry firearms. “If you look at what happened in Paris, I’m not saying if more citizens had had guns it would have stopped the terrorists. But it sure might have helped,” Craig said. For quite some time now, Craig and many other law enforcement leaders have been saying that people shouldn’t rely on police to respond during emergencies. Whether or not they’re telling people to take matters into their own hands because of budget cuts and response times or because so many law enforcement professionals are passionate about the right for citizens to bear arms is an open question. But one thing is clear: Craig is certainly correct that calling 911 in Detroit means waiting around. Back in 2013, the local response time was just shy of one hour. The good news is that this presents entreprenurial types an opportunity to cash in on people’s fear of violent crime. 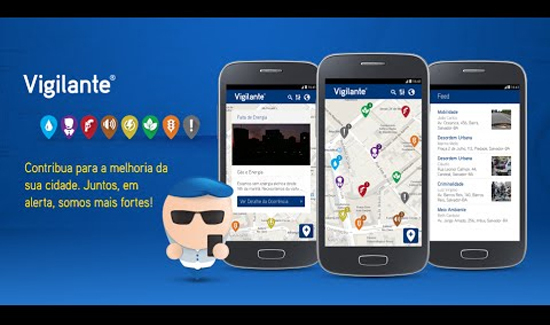 Check out this video ad for a new app called Vigilante. If you’re about to be raped, killed, or otherwise assaulted, just hit a button on your phone and everyone in your immediate vicinity (and maybe, eventually, the cops!) can spring into action and save the day. Either that, or everyone gets shot. A lot of the new private public safety market start-ups are still works in progress at this point.